We all pray for more – more money to get us to the end of the month, more time with our kids, more patience with the people who annoy us, more time in the day to get things done. In one of the famous prayers in history, St. Patrick prayed for more too. But unlike most of our ordinary prayers, St. Patrick prayed for more Christ. The first time I heard this portion of what has been called St. Patrick’s “Breastplate prayer,” I was in my college Chorale and it was the text of an anthem we were singing. Since that time, I have remembered this prayer and often come back to it, especially when my prayer life is in a rut and my prayers start to sound selfish. St. Patrick’s desire to increase the presence of Christ in every nook and cranny of life is something I want for my life too. And I believe it is what Jesus wants for all of us. When your prayer life feels dry and you find yourself using the same words and making the same requests, take a cue from St. Patrick and pray for more Christ. What richness we have in our Savior! Oh, how Jesus longs to give us more of Himself! We have only to ask. This article originally appeared in “The Connection,” – the weekly bulletin for FSBC Lawrence. Henry Blackaby and Ron Owens posed this question in their study on worship; Worship Believers Experiencing God. You can purchase it here. What does it mean to worship God in Spirit? It’s a question worth asking. For a more detailed answer you really should buy the study book. But I’ll try to convey a couple of Blackaby and Owens’ points. When Jesus says the Father is seeking “worshipers” who will worship in spirit and in truth, I don’t think he means that God is seeking a “spirited” display of music and singing. In fact, it has little or nothing at all to do with music. Rather, we become true worshipers of God by being born of his spirit. The Father is seeking true worshipers. He desires worshipers whose hearts are filled with His Spirit. Worshipers who worship in spirit have come alive in Christ. They have been born of the spirit into the kingdom of God. Worshipers who worship in spirit have hearts responsive to the conviction of the Holy Spirit. They confess and repent, and offer worship from hearts that have been cleansed, forgiven and restored by Christ. 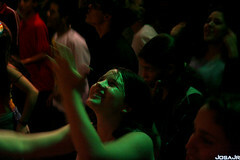 Worshipers who worship in spirit focus on God with and without the use of music. Music is only one vehicle of expressing their worship. Their love is also expressed to the Father through obedience, service, loving others, and living out a testimony of grace that woes they lost friends to the Savior. Father, I long to be the kind of worshiper You seek. My heart is Yours. Forgive me when I have sought to offer You worship through a heart of pride. I repent and bend my heart toward You that I may know Your joy and worship You in the way You desire. May I worship You in a spirit of obedience and love that goes beyond an hour on Sunday and saturates my everyday life. There are two statements that have stuck in my heart this as I listened to Jesus Manifesto, a book I had previously read. Our lives are a testament to the God we love and serve. But the world is not always seeing the true testament of God through his people. They only see a mere picture of our hypocrisy. What happens when we say we love God, but are afraid of taking scripture too seriously? The nonbelievers around us might never pick up a Bible. They have only our lives as a window to the greatness and glory of God. What do they see? How do our lives translate scripture to the world? Religion in its’ purest form before my neighbor is this: Dress up on Sundays, smile pretty and convince everyone that your life is a dream. Carry a big Bible, sing and clap (but not too enthusiastically or they’ll think something is wrong with you) and attend church at least three Sundays per month. The two statements at the top of this article remind me of what James says about faith. Serving God and loving others, is the natural product of a living breathing faith. Because God loved us first, (while we were still sinners) and we are filled with his love (in Christ), his love will overflow and touch everyone around us. If we love him, we will love others. I want to be clear. I am NOT saying that we work hard and discipline ourselves in order to prove our love for God is real. What I AM saying that the more we fall in love with God, the more we will naturally obey and keep his commands – the more natural it will be for us to love others. The anonymous quote above could be rephrased like this; It is possible to do good works without a living faith, but there is no such thing a living faith that does not produce good works. If you are feeling that your faith is dried up or you feel burned out, then it may be that you have been attempting to do the good works on your own. Perhaps you have previously thought of good works as a penance. Maybe you thought you had to prove your love to God by doing good things for him. There is a better way. Fall in love with Jesus again. Discover again in scripture how much you are loved and treasured by God. His word is a love letter to you, not a check list of good works to do. Let the power of HIS LOVE change you. Transformation is the work of the Holy Spirit. Let him do it. Just as we can not save ourselves, we also can not transform ourselves. You are NOT the potter. You are the clay. It is Jesus who has brought you from death into life and Jesus who makes you new. Trying to do good works without a living breathing faith is like manually tying ripened fruit to the branches of a dead tree. The work is laborious and exhausting. The fruit quickly perishes and the tree is incapable of producing more fruit to replace it. So you begin the laborious and exhausting work all over again. Burnout is inevitable! Real living breathing faith that naturally produces good works is like a tree, healthy and beautiful, planted by streams of fresh water, whose roots run deep into soil rich with the essential minerals to nourish it. It produces the best fruit season after season – fruit that is a blessing to all who encounter the tree. Discipline is good. A living breathing faith that reproduces love, joy, peace, patience, kindness, goodness, faithfulness, gentleness and self-control is better! It Is Better To Suffer For Doing Good! It’s been easy for me to get discouraged lately. I read the news and watch the holy ordinance of marriage attacked by a godless society. I read further and discover that religious discrimination is thriving in New York. There, it is not only lawful to deny churches the ability to rent public school space for worship, but it is mandatory – punishable by heavy fines. Yes, in New York, it is a state mandate to discriminate against Christians! At the same time Christian organizations are being forced to go against their biblical convictions regarding abortion. Faith based companies are being forced to pay for healthcare that provides coverage for contraceptives including the abortion pill – deceptively labeled “emergency contraceptive.” Don’t be misled. This is not just an attack on Catholic hospitals. This creates a problem for ALL faith based organizations. Do not be overwhelmed by this temporary suffering. God is not mocked! Christian, do not lose heart. Jesus has overcome the world. This world is only our temporary home. Our victory, in Christ, is certain and eternal! For a long time in the United States, we have heard and even joined the mantra “God and Country.” Somewhere along the way this changed. While we were looking the other direction, our Country has declared itself to be god. Now, it seems the government tells the church what is right and what is wrong. The government has made it clear that it has no use for God or His church. Our most treasured freedom is being dismantled. Freedom of Religion and the free exercise thereof, has no meaning if our government mandates when, where, how, and to what extend the Church may practice Biblical teachings. To the Christ followers in America this is unfathomable! However, Christians all over the world and all throughout history have faced oppressions far greater than these – Yet They Stand! 13-18 Be prepared. You’re up against far more than you can handle on your own. Take all the help you can get, every weapon God has issued, so that when it’s all over but the shouting you’ll still be on your feet. Truth, righteousness, peace, faith, and salvation are more than words. Learn how to apply them. You’ll need them throughout your life. God’s Word is an indispensable weapon. In the same way, prayer is essential in this ongoing warfare. Pray hard and long. Pray for your brothers and sisters. Keep your eyes open. Keep each other’s spirits up so that no one falls behind or drops out. Because the trials of this life never take a time-out, because the world’s bombardment against Christianity never takes a break, we can not abandon the struggle. I encourage you to pick up His banner and serve within your churches in community. Serve outside the churches; everywhere you are. Stand up for what is good. Let Peter’s words guide us daily as we seek to love those who hate the God we serve. While reading the book “David,” by Chuck Swindoll, I came across the section where David played on the lyre for Saul. As I read this section, I knew I would have to return and spend some more time. As a worship pastor, I was intrigued by the contrast between Saul and David’s purpose for music. It is not really possible for us to know why God did this. But we know that this harmful spirit was “from the Lord because it plainly says; a harmful spirit from the Lord tormented him. We can realize that, in the Old Testament, God’s spirit didn’t permanently rest on any one other than David and John the Baptist. It wasn’t until the Day of Pentecost that God would send His spirit to permanently rest on His people. As Swindoll says, “when the Spirit of God comes into the believing sinner as salvation, He never leaves.” God no longer causes His Spirit “to depart from” those who are “in Christ,” nor does He send a “harmful spirit” to torment those of us who are “in Christ.” But He did do this to Saul. It is widely thought that God did this as a form of judgement for Saul’s sin of turning against the Lord. This made it necessary for Saul to need soft, sweet music to relieve the spirit’s torments. We would all confess that we worship God because He commands it, and because He deserves it. But we would never say, “I worship because God deserves to refresh me.” It just sounds weird! When it comes to worship, we don’t want to sidestep the object of our worship – God Himself. We miss the point when we focus only on what we can gain. King Saul was tormented, because he was disobedient. The soothing music allowed him a way to cope with his torment and gain temporary relief, without having to actually repent and obey God. Saul had no intention of reconciling himself to God. He settled for the temporary refreshment. David gives us a complete contrast to what we see in Saul. Where Saul has the goal to soothe his tormented soul, David desires to be made right in God’s presence. Saul desired to be pleased by the music, but David desired to please the Lord. The sacrifices of God are a broken spirit; a broken and contrite heart, O God, you will not despise. Psalm 51:17. In Psalm 51:11 David, in his song, asks God, “Cast me not away from your presence and take not your Holy Spirit from me.” How interesting! This same David who played to soothe a tormenting Saul, from whom God’s spirit had departed, now asks that God not take His spirit from David. I don’t know about you, but that seems like more than a coincidence to me. I’m so glad that we no longer have to resort to that request. Jesus declared that He would always be with us. Never will he leave us or forsake us. As we’ve already learned, God did not permanently rest his spirit on any one until the Day of Pentecost, except for David and John the Baptist. So, the question is – what is our goal when we worship? Is it to be soothed, refreshed and made to feel better, or is it to die to ourselves and offer wholeheartedly our very lives to God? Do we choose to make confession, or do we choose to seek refreshment while we live our lives in disobedience to God? I didn’t make any “New Year’s” resolutions this year… There. I said it. Each year I make a few and always fail to follow through. I start off well, but inevitably, I always regress back to the norm. What I need to do is redefine what my normal is. I need a new normal. 2 Corinthians 5 talks about a new normal. It would be a good place for all of us to begin the New Year. Perhaps the reason many of us continually fail to follow through on our resolutions is because we make resolutions based on living for ourselves. Too often I fall into the trap of thinking that God’s whole existence is to make MY IDEA of “the good life” become a reality for ME. “I can do all things, through him who strengthens me” is not a verse about ME. It is a verse about CHRIST! I can pursue God’s will in every circumstance! When I try to live for God, in my own will, it doesn’t work out. I fail. It’s a trap to try and conveniently add Christ into OUR old normal. HE doesn’t fit there! The only way to grab hold of the new life is to die to the old one. Whoever belongs to Christ has become a new person. The OLD LIFE IS GONE. We are foolish when we try to go back to the old life and live in our will. Let us all fully embrace the New Normal – this new life, in Christ. And may we never, ever let go of him. We love singing all the Christmas carols this time of year. It’s because we are so mindful of Christ birth. But the angel said to them, Do not be afraid. I bring you good news of great joy that will be for all the people. Today in the town of David a Savior has been born to you; he is Christ the Lord. this will be a sign to you; You will find the baby wrapped in cloths and lying in a manger.” Most of the time (because we’re in a hurry) we only sing the first and maybe the last verses of these great carols! Shame on us! And shame on you, worship leaders! We are leaving out some really important theology and as a result robbing our congregations of knowing more about the Christ, the promised One. We start this verse with “No more let sins and sorrows grow or thorns infest the ground” and we recognize the fall of man. This is the story we know from the opening chapters of the Bible when Adam and Eve – of their own free will, and tempted by the serpent – disobeyed God and ate the fruit from the forbidden tree. When they confessed that they had ignored the one instruction God had given them, He cursed the serpent, then He cursed the woman and the man and he cursed the ground. “He comes to make his blessings flow.” What kind of blessings? We often think of blessings as ‘stuff’ that is not the case here. Jesus is the blessing from God – the One who brings salvation from this curse. Watts appropriately uses the verb “flow” because Jesus is the Living Water. He is the curse lifter, the Redeemer of the earth. He is the Promised One that the prophets spoke of. He clothed Himself in our injured flesh and entered a world that had been cursed – a result of a fallen humanity. He died a sinners death, was buried and rose again bringing us eternal life and returning to us the fellowship between God and mankind that we haven’t been able to know since the garden of Eden. And He will come again and the curse will be completely lifted and we will once again enjoy the fullness of His presence. “Far as the curse is found.” The blessing of Jesus is also relief from the curse. He will return again to gather his children and resurrect the dead in Christ. The curse will be lifted and he will make all things new again. Christ has not yet returned. Verse three is sung in anticipation of His second coming. In this one carol, sung at Christmas time, we celebrate His first coming and we also, with our spiritual eyes, look forward to His return. This past weekend the Choir and Drama teams presented our Christmas program. What a fantastic job these wonderful people do each year! I have such a privilege to work with singers and actors who love Christ and long to see Him lifted up. We greatly desire to overcome this expectation for music and drama in the church. Our motivation is not to perform but to encourage. I believe that churches should have a different motivation for the way they use music and drama. We hope to see music used in the more Biblical practice of encouraging the fellowship of the family of believers – to remind ourselves and one another of the richness we have in Christ Jesus. On Sunday, in particular, that we would Marvel at the Manger and how Jesus chose to come at the humblest of times in the poorest of places and present Himself to the least of all peoples. The challenge we undertake each year is to remind the body that Christ is the center, not only of Christmas, but of our very lives. All of us need these constant reminders. We long to lift Him up through the songs and scripts we present, but we also hope to use those songs and scripts to challenge the church body to lift Him up with their lives – to weave Jesus in to the fabric of their everyday lives. Accordingly, on Sunday, we ended the morning with a congregational song declaring Jesus to be the Messiah. Lord of ALL! Lord of the season. Lord of the church. Lord of our homes. Lord of our song! Lord of our friendships. Lord of my life. Lord of all we say and do. He is the Messiah and He is LORD! I’ve been a worship pastor for 18 years. Much has changed for us with regard to worship in the church. New technologies such as big screens with moving video backgrounds have found a home in our places of worship. That’s not a bad thing! It’s also not the “bees knees” as they say. Well some people use that phrase. It seems that the one thing that unites the churches of God today is that we love to fight about worship style. As Stephen would say – “You stiff-necked people!” GET OVER IT! Are you too blind to see that it is not the Father who has caused you to be so opinionated about music or to prefer a certain style? No, it is the evil one who divides us. Too many of you have chosen to love your music style more than you love the One you’re attempting to sing to. You have forgotten your audience is the living God. He is not impressed by your style! He is interested in your broken and contrite hearts! Psalm 51. When did it happen that we began to replace loving God with music appreciation? Do we really expect that God will one day place a crown on our head and say; “I’m so glad you forced your new songs into the the fabric of church life, totally relevant, dude?” or will He say “Thank you for fighting to keep hymns in the church. Those are my favorites too?” Absolutely Not! I understand all the reasons and all the arguments people offer for adding technology and for calling upon various styles and they are not bad reasons. We want to be relevant in our methods. This is a good thing. We desire to sing our songs in musical languages that our guests, who may not have a church background, can understand. This is noble. I’m in agreement with these motivations, however (COMMA, DOT, DOT, DOT) let us keep our primary motivation for music and its accompanying technologies centered on Christ. Colossians 3:16Let the message about Christ, in all its richness, fill your lives. Teach and counsel each other with all the wisdom he gives. Sing psalms and hymns and spiritual songs to God with thankful hearts. Sing, Sing, Sing! People of God, sing TO each other and be encouraged. Sing WITH each other to God and give Him thanks and praise. Sing AS ONE body and dwell in unity! This is what psalms and hymns and spiritual songs can help us do. What God meant as a tool to remind us to be filled with His richness and to unify us, the evil one has used to divide us. The evil one has no greater joy than dividing the people of God. Father, forgive me when my pride has derailed my best efforts to worship You. At times I have made an idol out of my own tastes and traditions. Forgive me, Lord, when I’ve failed to encourage others because I pretended that style was synonymous with worship. I long to be filled with the richness of Christ and to encourage others to be filled with the same. Help me use ALL psalms and hymns and spiritual songs, new and old, as a medium for the body to worship and give thanks as one.